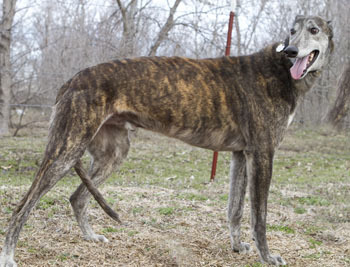 Harry is a 9-year-old brindle male born in April 2004. He arrived from the same source as Onyx, Carbon, Charity, Clooney, Cupcake, Timex, Stetson, Stewart, and Blade. 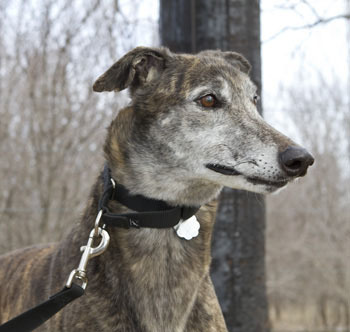 Unfortunately all ten arrived testing positive to heartworm. He also had a heavy load of intestinal parasites. Harry is tattooed; however his tattoos are difficult to read and are still being researched at this time. This big boy's long, 10-month journey back to health is finally complete! Harry is cat trainable. He would do best in a home with no small children. Harry is very sweet, and is slowly bonding with his human. He spooks very easily by sound or movement or being suddenly restrained - sadly, he had minimal contact with humans while growing up. He needs an understanding family with no small children to startle him. He likes to play with other dogs, and with his people. His favorite game aside from collecting toys (his "babies"), is playing fetch with them. He likes to know where his humans are, but does not feel the need to be around them 24/7. He does have a few anxieties, and should not be crated, but he has perfect house manners. He would love a doggie door so he could go outside and enjoy a little sunshine as he pleases. He is blossoming into a very playful boy - craving love and companionship. This boy deserves a lot of love to make up for his neglected youth!